I'm a little late in sharing my favorite candles - I would have liked to share this before the holiday season, but in case you still owe people gifts, are already looking ahead to Valentine's Day or are just in the market for some amazing, yet affordably-priced candles for yourself, I've narrowed it down to my top picks, most of which I became familiar with at the New York International Gift Fair (NYIGF) back in September. Godiva Chocolatier's Home Fragrance Collection - if you love Godiva Chocolate, then you'll love Godiva's sweet, decadent candles. The candles launched in October and are available at Neiman Marcus, Belk, Dillard's and online at bathandbodyworks.com (unfortunately they are not sold in Bath & Body Works stores). The regular sized 7 oz candles retail at $22.50 and have 50 hours of burn time. The 4.4 oz travel candles retail at $12.50 and have 10 hours of burn time. The regular sized candles come in chocolate brown tinted glasses which hold chocolate colored wax infused with cocoa butter. The collection includes five different fragrances: Milk Chocolate Truffle, Raspberry Ganache (my favorite Godiva chocolate), Black Almond Truffle, White Chocolate Magnolia and Peppermint Bark. 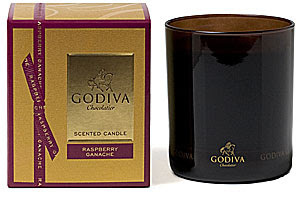 They smell good enough to eat, so it would make perfect sense to gift one of these candles with a box of Godiva chocolates. I most definitely plan on getting the Peppermint Bark scented candle. That one is perfect for the holiday season. Kat Burki - known for luxury home products including furniture, bedding, lighting, accessories, art and body & bath, I was drawn to the 6.8 oz Hot Toddy candle, a holiday 2009 exclusive priced at $32.00. 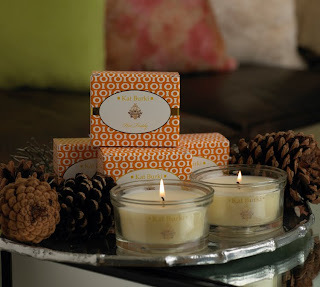 It is inspired by the Hot Toddy drink, the candle includes a mixture of apple and spice. I think a Hot Toddy drink, blanket and this candle makes for a relaxing night in watching shows on my dvr (I only wish I had a fireplace too!). 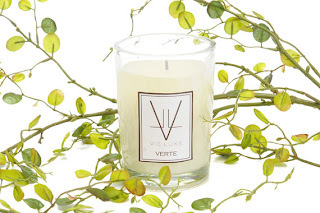 Vie Luxe - The Verte candle from Vie Luxe is an eco-luxe candle that blends natural soy and palm wax, beeswax and fragrance oils. The scent is crisp and clean, containing notes of Hyacinth, Narcissus and Green Leaves. All the components of the candle are 100% recyclable and biodegradable. Some of my other favorite Vie Luxe scents include Côte d'Azur (white lily, water hyacinth, friesa, pink rose and French verbana) and St. Moritz (bitter orange peel, moroccan clove and mulling spices). 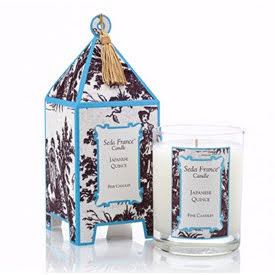 The 8 oz candles have a 60-hour burn time and retail for $45.00 at saksfifthavenue.com. 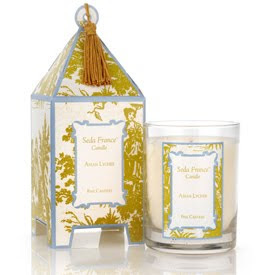 Seda France - two of my favorite candle fragrances from Seda France include Japanese Quince (rhubarb, passion fruit and white fleshed peach over a heart of white jasmine petals) and Asian Lychee (Lychee fruit, mango, papaya, cilantro, and green coconut leaves, also two of their best sellers. These full sized 14 oz candles retail for $32.00, with a 60-hour burn time. Bluewick - My favorite scents from Bluewick are the fresh, fruit inspired ones, like Yuzu and Guavapeel. These 100% soy wax candles come in a generous 15 oz glass, retail at $32.00 and have a 100-hour burn time. Definitely long lasting candles for the price! Stay tuned....I hope to share more of my favorite candles in time for Valentine's Day.